The Yankees lost a nailbiter Friday night, 5-4, to the Red Sox in the first game of the ALDS. The Yankees can take a lot of positives from the loss as they head into Game 2 Saturday night. They nearly stole a win in a game started by Boston's ace Chris Sale and their bullpen shut out the Red Sox for the final five innings after starter J.A. Happ left the game. If the Yankees take Game 2 at Fenway, they would head back to Yankee Stadium for the next two games of the series, and a realistic chance to close out the Sox in New York. The Yankees went 6-0 at home in last year's postseason, and had no problem with Oakland in the Wild Card Game Wednesday night. The new Stadium has become just as intimidating as the old building was for visiting teams to win. After the loss Friday night, Brett Gardner described Game 2 as a must-win. 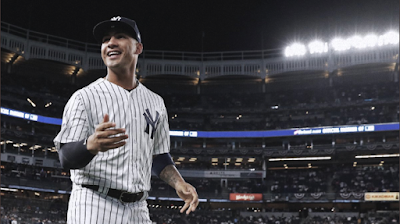 Second baseman Gleyber Torres, who went 1-for-3 with a walk and a strikeout on Friday night, said of what he thought of Saturday being a "must-win, "Yes, I mean, we lose last night, and today is another day for sure. But we need to win today for be a little bit a little more relaxed and be ready for starting home." Q. Gleyber, last night you said it is what it is, struck out. You said you turned a page. "Tomorrow is another day." Who instilled that in you? Where did you learn that from? GLEYBER TORRES: I mean, every game depends win or we lost. We need to pass the page. The other day is the other day. Last night for me is bad night. I strike out with bases loaded (in the sixth inning) and we lost. And first game of playoffs. But I mean, always I stay positive and I say last night, it is what it is. Today is another day and I'm focused. I think it's part of take a little more experience. It's part of maturity. And I think that's it. I'm focusing on doing my job today. And the most important is try to win and help my team. Q. Gleyber, what did you think of Judge's home run off Kimbrel last night? And what do you think is the best way to attack Kimbrel ? GLEYBER TORRES: Really good. I mean, we feel really excited and happy when Judgie got the homer. And Kimbrel is really good, we know that. He's a really good pitcher. I think that his attack, be ready for hit him, and be patient. I mean, try to take opportunity and try to do damage. Q. A lot of young players don't have this opportunity to play in the playoffs. Can you describe this experience for you. 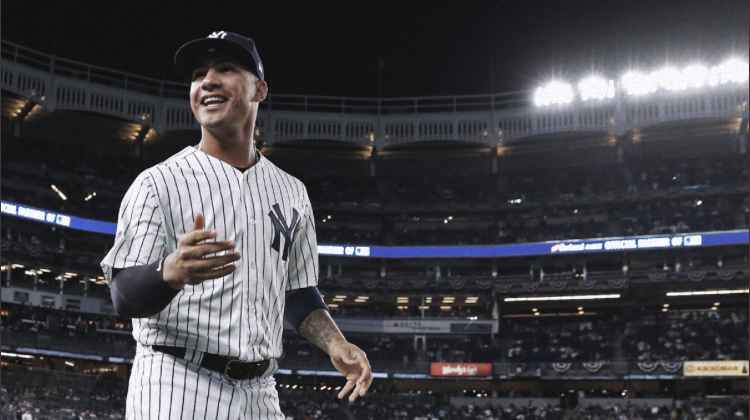 GLEYBER TORRES: (Translated from Spanish) It's very exciting to have an opportunity like this, especially my first year, and have the chance to go to the playoffs and be part of that. It's super exciting. At the same time I want to help, I want to enjoy the experience but at the same time I want to help my team. Q. The at-bat with the bases loaded, the pitch you struck out on was a really tough pitch. When you look at the at-bat, do you think, I wish I had gotten that? Did you have a hittable pitch in that at-bat that you maybe could have gotten to? GLEYBER TORRES: I mean, he pitched pretty well. He threw a couple of sliders, breaking ball and one fastball. At 3-1 he threw me a fastball away. To me personally I think it's a ball, but the umpire take a strike. It is what it is. And the last pitch I'm just focusing and tried to hit. He threw me a really, really good breaking ball. I think the best breaking ball of his night for him. I missed. It's past. I learned for sure. Last night is past. And I take the experience for tonight. I'll be ready. I hope I get the same opportunity tonight, and try to do damage and help my team. Q. Gleyber, this is the longest you've ever played in a year. How are you feeling and how are you keeping yourself prepared through this long season? GLEYBER TORRES: Really good. My body and mentally it feels really good. I feel real excited. And always I'm prepared. I mean, when the team called me up and I started playing in the Big Leagues first time, I'm really, really happy. Real excited and prepared. I think we got really good games during the season, but that game, for example, when we were playing with Houston, Baltimore, Cleveland, all the games helped me to prepare for the moment. I mean, all these games is really exciting, really a lot of fans. No, I take all that experience during the season and just try to enjoy the moment. It's more exciting for sure, but it's nothing like different. Just more people, more exciting again. But nothing different. Just try to be relaxed, enjoy it and do my job I think is the most important thing. Q. You spoke about your experience this year. Can you mention which one in particular is probably the biggest thing you learned during the season? And what are you looking forward to next season? GLEYBER TORRES: (Translated from Spanish) I want to say it's consistency. That's what we always are looking to achieve, consistency. Especially when you're facing the best pitchers in the world, if you may. So I want to say that's probably the biggest thing I learned over the regular season. And looking forward, I want to improve overall, cut back on some of my errors and keep working. Q. Gleyber, have you noticed since coming off the DL any extra care that you've had to take with your hip? Has it bothered you at all? Have you had to take a little more care before getting ready or something like that the second half of the season? GLEYBER TORRES: Yeah, after DL, just I do my routine. I have to exercise before the game. Nothing different. Just try to be ready for the game. Warm more and everything. Try to do my routine. But it's no big deal. I mean, it's like how I prepare to the game, and I do every day. Q. Do you still feel anything? GLEYBER TORRES: No, not really. I feel really good.